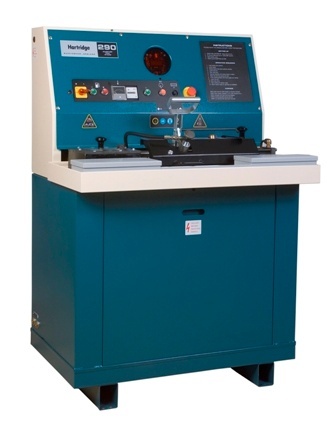 The Injector Calibrator HA290 was designed and built to provide extremely accurate and rapid testing of all Cummins PT injectors without the need for master injectors. It is a service level calibrator and is fully compatible with test standards and procedures set by Cummins. The injector Calibrator HA290 is fitted with a synchronous drive motor capable of maintaining 1050 rpm within plus or minus 1 rpm. Test oil temperature is maintained to within plus or minus 1º Fahrenheit, injector clamping pressure is controlled at 74 or 12 psi., within a tolerance of 1 psi., test oil is automatically controlled at 100 psi., with a tolerance of 0.25 psi. The HA290 has the capability to accept any type of Cummins PT injector, changes of cams, adaptors and stem extentions to handle different injectors is a simple and speedy operation. The easily changed cam is mounted vertically, and a transparent cambox lid enables rapid identification of the type of cam fitted. Two purpose built tool boxes are conveniently positioned and are provided with clips and brackets to stow tools, adaptors and stem extentions. The left hand box contains the cams, box spanner and 'T' bar, the right hand box contains the injector adaptors and stems extensions.